Spotted: Is Apple Maps 3D plotting for driverless future? 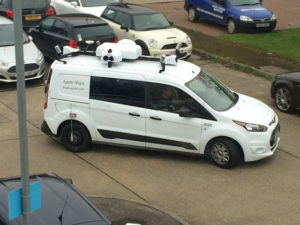 An Apple Maps vehicle has been spotted driving the roads of Hertfordshire armed with stereo cameras and multiple LiDAR to collect detailed mapping information that may have an autonomous vehicle role. Armed with a quartet of LiDAR, four arrays of stereoscopic cameras facing front, rear, left and right, as well as powerful GPS/GLONASS satellite antennae and a plumb line to measure vertical tilt, Apple Maps vehicles are capable of mapping an environment in three-dimensional detail – upping the ante compared to Google’s Streetview service that offers more rudimentary 360º surround footage. Previously, Apple Maps vehicles had been seen travelling around parts of the US and UK. The new sighting may indicate Apple is closer to rolling out a ‘Streetview’ service similar to Google Maps’ offering. In a bid to alleviate privacy concerns while making the potential use of the collected data directly comparable to Google’s competing service, Apple states that, “we will blur faces and licence [number] plates on collected images prior to publication”. 3D mapping is said to be one of the most important elements in the quest to produce autonomous vehicles, which could be a second use of the technology equipped to the vehicle. Apple has previously been rumoured to be working on autonomous technology as well as electric vehicles. More information on where Apple Maps vehicles are operating and when can be found here.